Isn’t this city just beautiful, within 20 minutes drive in any direction you’ll get to one of the most magnificent views anywhere. I only have to look out of my window at home to see my view; a take a short drive to see a stunning Sea Point Sunset or perhaps go on a hike up Lions Head? 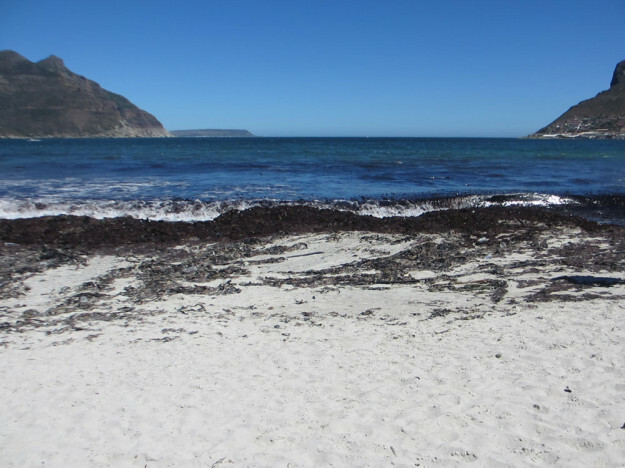 On this particular afternoon I went with the parentals for lunch in Hout Bay and after lunch we decided to walk along the beach. Check out the spectacular view, ok minus all the washed up kelp that was a bit smelly in parts … but the sound of the waves, the happy shrieks of the kids splashing around in the cold water and the dogs running and leaping over the sand after a ball or piece of wood is enough to make your heart happy. I think we forget in the hectic lives we all leave to stop and take in our surroundings. We are all far to quick to get home and sit in front of the tv or get back onto the laptop after we’ve spent the day behind a desk. We can’t forget about the amazing parts of nature that surround us, so I encourage you to take half an hour of out of your day – walk around the block, phone a friend and meet them on the weekend for a walk somewhere but just make sure you get out and appreciate your surroundings. There is something beautiful everywhere, but if we forget about it and take it forgranted it’s not going to last forever. Try it … let me know how it works out … Promise you’ll start to feel better about everything in life! This entry was posted in Luv and tagged beaches, cape town, luv, walks.